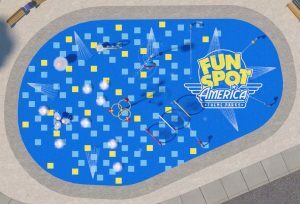 Orlando, Florida— 03/15/2019 — On Friday, Fun Spot America announced a new interactive water feature that will be opening the Summer of 2019 at the Orlando, Florida location. The new interactive water feature is designed by Orlando’s locally headquartered firm Aquatic Design & Engineering. 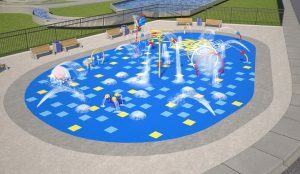 The new interactive water splash experience with over 30 interactive features that guests can immerse themselves into and will be included as part of the all-day armband pass that Fun Spot offers. • The new interactive water feature also conserves water using detection sensors that only run the features when guests are present. • All of the water toys and spraying elements have been proven to encourage child development and stimulate the brain through toys that move, twist, or spin.